Flash: China Claims First U.S. Open Trophy! You thought Rory McIlroy had the trophy, but it turns out our good friends in China--well, our partners--have decided they'd like to keep it. Bernie McGuire reports on Chinese authorities seizing the cup first handed to Horace Rawlins in 1895. "Taxpayers Left To Pay U.S Open Tab?" 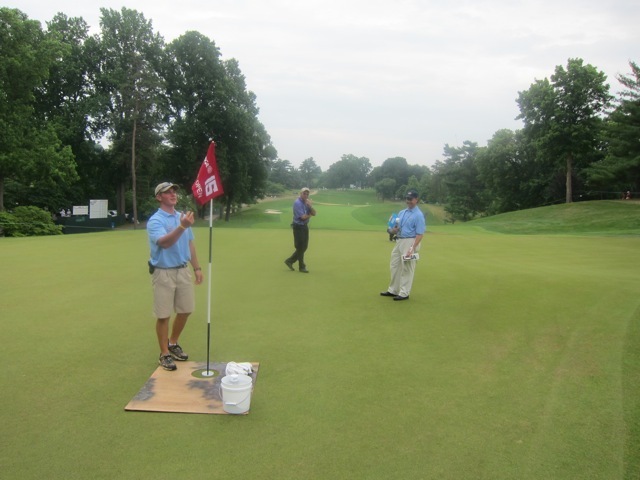 Delia Gonçalves of WUSA TV reports on Montgomery County wanting more money from the USGA for unanticipated overtime pay from this year's U.S. Open at Congressional. "The U.S. Open was just a factory to take your money." "It's just what I think the game really needs right now, someone that's going to set an example that says you can play fast and win at the highest level." His dominating performance at the U.S. Open has been talked in the ground, so much so that CBS's Jim Nantz decided to point out something else besides McIlroy's demeanor and swing that kids should take note of. "One thing I really enjoyed last week while watching Rory McIlroy's incredible performance at the U.S. Open was how fast a player he is," Nantz said. "Here's a guy that's going to be a superstar and a lot of people are going to try and model things after him ... especially kids watching him play. It's just what I think the game really needs right now, someone that's going to set an example that says you can play fast and win at the highest level." The caveat: Nantz mentioned this as Johnson Wagner was preparing what one could only surmise was the last shot of his life. It was agony and credit to Nantz for showing no hesitation in sharing his thoughts on Rory, without calling out Wagner. That's for us bloggers to do! Battle Of The Macs: Rory and John To Have Tennis "Knock-up"
An unbylined Belfast Telegraph story on the latest thrill from Rory's post-U.S. Open victory tour. Fun loving US Open champion Rory McIlroy will today celebrate a career high golf ranking of third in the world - by having a "knock-up" with tennis legend John McEnroe at Wimbledon. McEnroe, still famous for his 'You cannot be serious' Wimbledon rant 30 years ago, threw down the challenge to tennis fan Rory via social network site Twitter. McIlroy has been on a week long party with friends and pop stars Olly Murs and JLS since his sensational victory at Congressional Golf Club last weekend. Beman: "The advances in technology have greatly reduced the advantage of the physically superior." Good to see Deane Beman continuing to shine a light on the technology debate as he battles with Golf World's E. Michael Johnson in this week's issue. "The entire sport of golf likely will be faced with a fork-in-the-road decision in charting its future." Jim Achenbach assesses the U.S. Open at Congressional and concludes that the "gulf" between regular golfers and the professionals has "grown dramatically" in recent years with the need for a resolution appearing more evident than ever. Miraculously, there was no NFL Mid-Summer Arrest Report Issue to run, so Sports Illustrated managed to squeeze in the rare golf cover. Pretty cool shot. I'm not sure who the photographer is. As promised, here is my Golf World story filed from Congressional and looking at the various elements playing into the setup, soft conditions and low scoring. Tiger is out of the AT&T National but is still going to appear at the event next week, reports Doug Ferguson. Woods is scheduled to be at Aronimink next week, to sign the "We Salute Our Heroes" tribute wall in which fans can write personal messages to the U.S. military. He has a news conference Tuesday afternoon, and is expected to take part in the military opening ceremony on Wednesday. Meanwhile, Ron Sirak contrasts McIlroy with Tiger after last week's U.S. Open. When it came time for McIlroy to face the media -- never one of Tiger's favorite chores -- that humility was captivating. With the trophy sitting next to him, Rory took out his cell phone and snapped a photo. "I have to tweet it," he said. "I've waited all week to do this." After the Masters, McIlroy tweeted a photo of him smiling next to Charl Schwartzel, who had on the green jacket Rory could have been wearing. It was a gracious gesture. After taking his trophy shot Sunday, McIlroy turned his camera toward the hundreds of writers in the room and snapped a photo. In nearly 15 years as a pro, nothing close to that spontaneous ever occurred with Woods. Right now, Tiger has 14 majors and Rory has 13 fewer. But McIlroy is also 13 years younger and has connected with the public in a very special way. I see Golf Digest readers are in a tizzy over the U.S. Open low scoring this year and I've seen some correspondences from the blue blazer world lamenting this year's setup and forgiving course conditions. Before you overseas readers tell me you've seen this, remember we Americans haven't been as obsessed with Rory McIlroy. Therefore, fun stuff like this Rory television appearance in 1999, eerily reminscent of Tiger's Mike Douglas Show, gulp, hit, is set up and explained by Alex Myers. "The obvious question is: What the hell has happened to American golf?" There are a couple of good reads today about the continued decline of American performances at majors following the U.S. Open where Kevin Chappell and Robert Garrigus were the low Yanks (though it should be noted that Chappell, a former NCAA champion, playing his first U.S. Open finished T-3). But according to SBJ, they peaked at 7.4 from 7-7:30 when Rory McIlroy was finishing off his record breaking win. Alright, here we go. Historic day calls for historic hyperbole! Golf’s next great prospect is every mother’s son, a self-effacing and unaffected 22-year-old from Northern Ireland, who bounced down the fairways to win his first major championship Sunday with a smile, a shrug and an incomparable swing. All hail Northern Ireland, golf's new global superpower, and all hail golf's new superstar Rory McIlroy, who won the 2011 US Open at Congressional Country Club in a style that earned favourable comparison with some of the game's greatest performances. The 22-year-old from the small town of Holywood emulated his compatriot Graeme McDowell, who won this championship at Pebble Beach last year. And then some. Maybe they will change the name of the venue to Processional after what Rory McIlroy achieved on an historic afternoon at the 111th US Open at Congressional. Rory McIlroy buried the memory of his Masters meltdown the same way he buried the competition at the U.S. Open, with a breathtaking performance filled with the promise of more majors to come. "Rory McIlroy, the irresistible young Congressional candidate, was sworn in last night as golf's new global leader after a victory in the 111th US Open which was as thrilling for the game as it was chilling for his rivals. Washington is well accustomed to landslides but even the nation's capital was left open-mouthed by the one-sided nature of this contest. "The clarion call was distinctive, and the response unerring. And, in this 111th edition of the US Open, Rory McIlroy – destiny’s child – answered the cry from those who bestow such favours with a breathtaking display never previously witnessed in this storied major championship: he shot a finishing round of 69 for a record low 268, 16-under-par, to claim a breakthrough maiden Major at Congressional Country Club yesterday. Genuflect at the feet of the man responsible for the lowest aggregate in the history of this event; 16 under par. Pay your respects to a player that might yet redefine what is possible in this sport. As he walked up the 18th to deafening acclaim, nothing seemed beyond Northern Ireland’s Rory McIlroy. Stand aside Barack Obama. The most important man in ­Washington yesterday was Rory McIlroy. And stand aside Tiger Woods. Your era as the greatest golfer on the planet is well and truly over after McIlroy marched imperiously to glory carving his name in golfing legend. Just 71 days ago McIlroy suffered his infamous Meltdown at the Masters. Meltdown? What meltdown? Any fears that he was still scarred by the events of that April afternoon in Augusta were groundless as he turned the 111th US Open into a royal coronation. Forget about the wounded Tiger —Rory McIlroy is the man to top the 18 Major championships won by Jack Nicklaus. This bold prediction was made by three-time Major-winner Padraig Harrington, no less, as Congressional Country Club remained firmly in the grip of ‘Rory-Mania'. This matters because the majors clock is now ticking on McIlroy. Like it or not, you can argue that McIlroy might have a better chance of tying or surpassing Nicklaus' record than Woods does. Woods has a 13-majors lead on the Northern Irishman, but McIlroy leads Tiger in the health category -- no surgical scars on his knees, no emotional scars on his personal life. He also has at least, what, 20 more good years and 80 more majors left in his career? "There's a long way to go, isn't there?" said McIlroy's agent, Chubby Chandler, who hinted that Rory might increase his U.S. playing presence. "Certainly he has the talent." People used to revere Tiger. They LOVE Rory. They serenaded him along his victory parade. "Let's go, Rory, let's go," they chanted -- America's version of Ireland's "Ole, ole, ole, ole." It was a Tiger-like performance. And now the comparison will begin, and while it may be a bit premature, it is not unfair. There are a lot of similarities between the two. And yes, McIlroy does now have 13 fewer majors than Woods, but Rory is also 13 years younger than Tiger. Woods won his first major at 21; his second, the 1999 PGA Championship, at 23; and at the age of 24, had his record-setting 2000 season, becoming just the fifth player to complete the career Grand Slam. Through his first 10 majors as a professional, Woods had one victory. McIlroy now has one major through his first 10 tries as a pro. All of a sudden does it really matter if Woods is playing in the British Open? "This guy is the best I've ever seen, simple as that," said Graeme McDowell, who won last year's Open at Pebble Beach. "He's great for golf. He's a breath of fresh air for the game and perhaps we're ready for golf's next superstar and maybe Rory is it." With Woods now damaged goods, golf is in desperate need of a new star and the youngster from Holywood, Northern Ireland, couldn't be more perfect if he came from central casting in Hollywood, Calif.
"There is little argument that McIlroy, who held at least a share of the lead at some point in the last four majors, is now the best in the game, if not No. 1 in the rankings. He is also the top draw, for adults and especially kids. Todd Hamilton, the 2004 British Open champion, was just finishing his eighth hole on his way to a final-round 70 Sunday when his youngest son, age 8, turned and asked his mother, "When can we go see Rory McIlroy?" Everyone wanted a glimpse of the game's next big thing, a player who stood out from an early age but who may have been too nice, whose maturation had at times been hard to watch. "He's going to be the first Rory, not the next Tiger," Miguel Angel Jimenez said as he left the club shortly before McIlroy teed off. "Tiger was Tiger. Nicklaus was Nicklaus. Palmer was Palmer. Rory is spontaneous, he's happy with his life, and he's going to rule the game of golf." Even McIlroy’s new putting coach, two time major winner Dave Stockton, believes that the Ulsterman is now an all-American hero. You can't win multiple major championships without getting the first one, but even coming close on multiple occasions does not guarantee that such an achievement is imminent. Sergio Garcia and Colin Montgomerie serve as excellent examples. Who could have imagined 12 years ago at Medinah -- when a 19-year-old Garcia finished one stroke behind Tiger Woods at the PGA Championship -- that Garcia would still be without a major title in 2011? Garcia, who had to qualify for this Open, managed to tie for seventh, assuring a return trip to the Olympic Club next year. It was his 16th top-10 in a major championship, and he has nine top-5s. But no victories -- and he's not sounding confident, at age 31, about when a major will come. "Maybe I'll get lucky one day," he said. "I know at the moment it's probably tough for me to get one because things are still not right." Many will compare this McIlroy victory with Woods’s 15-shot margin to win the ’00 U.S. Open. That’s not the best analogy. That Woods win was on a truly tough Open course with vicious rough; firm, fast greens; and ocean breezes. The next-best score was 3 over. McIlroy deserves every accolade he gets for 16 under. But McIlroy shooting zero at defenseless Congressional wasn’t as impressive as ’00. It was also a victory for those who believe in karma. McIlroy’s gracious and mature response to failure at the Masters earned him new fans, something evident as he walked his rounds at Congressional. Based on the surge of fans seeking autographs or just trying to be near him, he was easily the most popular golfer in the field. Now he is poised to make good on expectations that he could be golf’s next superstar, taking up a spot vacated by the faltering Woods. Dave Kindred says it all came together at No. 10. At the Masters' 10th tee, the kid hit a drive so far left it practically came to rest in a house. This time, in the Open, his 6-iron over water to the 10th green, 218 yards away, came to rest in our hearts. On the 10th tee at Congressional Country Club, waiting for the group ahead to clear the green, McIlroy took a bite out of a Nutri-Grain bar. Then he walked slowly to the back of the tee. In fact, the performance was so dominant and out of whack with the other scores at Congressional Country Club, fans and aficionados had to bite their tongues, lest they become too effusive. But what's not to love? The kid has panache, a swing to die for, doesn't cuss like a Green Beret or heave clubs, and eviscerated a course to such a degree, the members were speed-dialing architects, again. At what is billed as golf's toughest exam, a kid the same age as most college seniors aced the test as though he'd been given the answers beforehand. Like all true greats, McIlroy has an innate ability to make an endlessly complicated and difficult game appear simple. With a club in his hands, he is Torvill and Dean on the ice, he is Frank Sinatra at the microphone and he is Lionel Messi with a ball at his feet. He has the potential to raise a mere sport to art form, his eventual status defined not by tournaments won and lost but by the views of his opponents and admirers. David Leadbetter said McIlroy has the tempo of Fred Couples, but with better positioning. Sean Foley called McIlroy a modern-day Sam Snead for his tempo and flexibility. Foley also compared the new Open champion to talents like Michael Phelps and Usain Bolt, athletes born with attributes that allow them to do things that others can’t. “It’s a really gifted golf swing,” said Foley, who teaches Woods. “I hear guys saying this is the swing you want to copy. You can’t, because you have to be able to have the mobility and rotary speed in order to do it. Teddy Greenstein on the low Americans Garrigus and Chappell. If this keeps up, Davis Love III, who tied for 11th, just might have to use a Ryder Cup captain's pick on himself. "I don't think the state of American golf is where everyone expects it to be," Chappell said, "but I think it's definitely going to go in the right direction." Not that Chappell is obscure or anything, but the USGA misspelled his name on his Sunday quote sheet. Twice. It was recorded as "Chapel." Michael Hiestand on all things television, from ratings to NBC's weird edit. NBC, to its credit, played the hand it was dealt without overplaying it — albeit after an initial stumble. With the Open in the Washington, D.C., area, NBC early on ran a feature with the usual flag-waving and monuments — there must be a law requiring sportscasters covering an event within a cab ride of the Washington Monument to check off the usual capital clichés — which also seemed a bit odd since the tournament was revolving around an Irishman. And NBC later cryptically apologized on-air for having "edited out" a "portion of the Pledge of Allegiance" — an apparent reference to viewers seeing kids saying the pledge but not hearing them say "under God." And NBC's Peter Jacobsen, in a skit, popping out of a portable toilet to get an autograph from lead analyst Johnny Miller wasn't clever. Transcript of Rory's post round presser. And finally, GolfDigest.com posts this image gallery from Sunday in case you were hoping to relive the early 90s nightmare that is Y.E. Yang's shirt. Barry Svrluga in the Washington Post with a story on the club and its prospects of a future Open date. But move out 15 years, and consider the following scenario: It is 2026, the United States is celebrating its 250th birthday, and the USGA brings the U.S. Open back to the nation’s capital. There just aren't many compelling reasons to come back, either. **In Golf World Monday I write about Congressional's chances and also suggest that this may be the last we've seen of the course for a while in more ways than one. It's Rory's world and we're all just living in it. The golf course remains moist and the humidity isn't helping much, but the greens do seem to have just a bit more firmness today, though not enough to make a huge difference. The USGA's Mike Davis anticipates that it's just enough firmness to actually make well struck shots into greens spin back even more than the last few days.